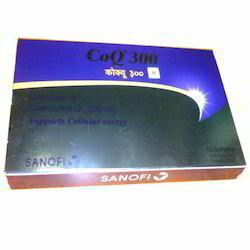 We are offering COQ 300 Capsule to our clients. CoQ10 (short for Coenzyme Q10) is an essential element for many daily functions and is required by every single cell in the body. As an antioxidant that protects cells from the effects of aging, CoQ10 has been used in medicine practices for decades, especially in the case of treating heart problems. It has a unique combination of essentials such as co enzyme Q 10, L- Arginine, Vitamin E and Methylcobalamin which are known to be good for maintaininghealthy heart. It may help in strengthening of heart cells by converting fats into energy, supports energy production in cells.